I feel like I've given these a really solid testing period by now and am ready to give you my thoughts on all of the products. 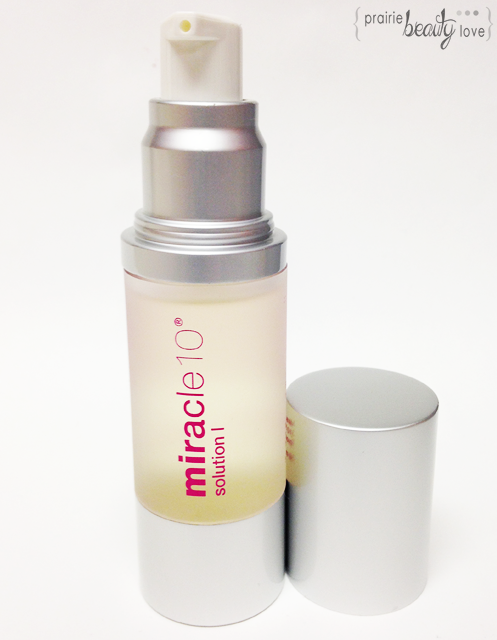 Miracle 10 promises to offer results in 10 Hours, 10 Days, and 10 Weeks, and I feel like I can definitely give my thoughts on the 10 Hours and 10 Days promises at this point. Keep reading for a look at the products included in this collection as well as my experiences and thoughts on each of them. 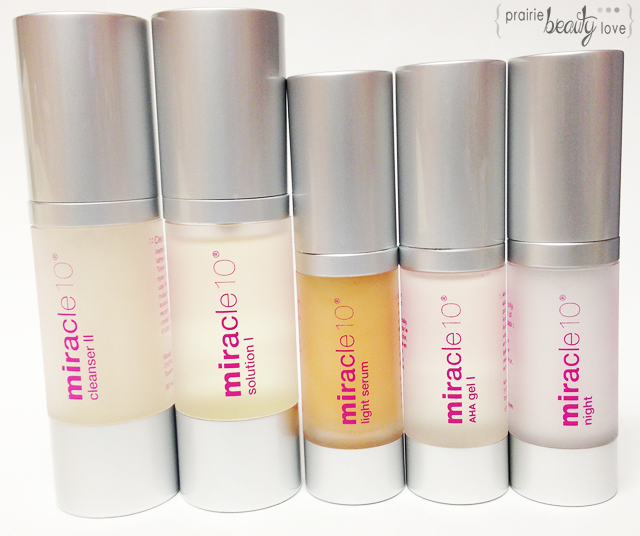 Miracle 10 Cosmetics, launched in 2005, is an independent Canadian skincare company offering a clinically-advanced, cutting edge skincare line that incorporates proprietary formulations in maximum, active concentrations. 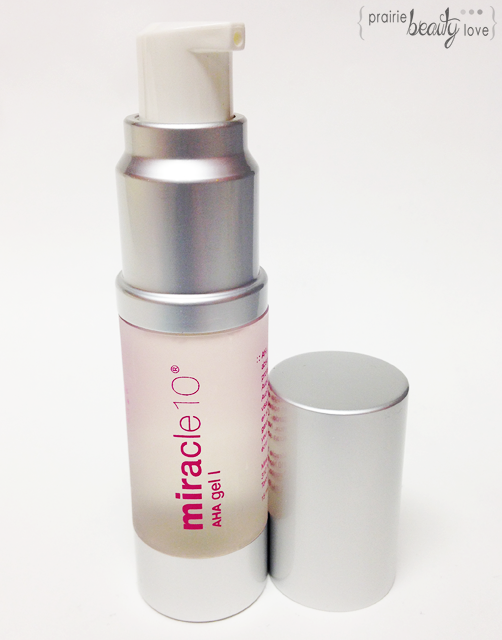 Calibrated just below what is considered "medical grade", the Miracle 10 skincare delivers highly effective results without the need for downtime, helping people look their absolute best. This beautifully formulated 6-step skincare kit for Normal/Maturing skin is designed to visibly improve damage caused by sun exposure, extreme weather, pollutants, smoking, dehydration and age-related conditions such as fine lines, wrinkles, sun spots, dull skin surface and uneven pigmentation and leave skin feeling smooth, dewy, and supple with a luminous, youthful look. An active foaming, non-drying, antioxidant rich, pH-correct cleanser with exfoliating properties, designed to remove makeup and deeply cleanse the pores, removing oil and skin debris leaving skin completely clean and glowing. I make no bones about the fact that I love cleansers. I love trying out different cleansers of all different shapes, sizes, and formulas. I would say that I like, but don't love this particular cleanser. I feel like this cleanser really does get my skin clean without leaving any film behind at all, which is an important thing for me. My only problem with this is that because it is a foaming cleanser, I do find that I can have a little bit of tightness after I cleanse before I put on the rest of my products. Now, when I say "a little bit", I truly mean it. It's not tight or uncomfortable like a lot of foaming cleansers, but I can really tell that this would be a little too much for me in the drier, colder months. At this time of year, though, I'm finding that I really like it. I've been using it on its own in the morning, and following a makeup remover such as a cleansing oil or balm at night, and I like it for both applications pretty equally. An active de-congesting, skin toning exfoliator with skin-lightening agents and anti-fungal and anti-microbial properties. Skin feels re-energized and appears more clean and even in tone with regular use. I've been going through this like gangbusters, I have to admit. I feel like the pump cap isn't the best way to distribute this product, because it squirts out in a weird, air bubbly kind of way. That said, I love this toner. I've been mostly applying it with my hands and patting it over the skin, which I wouldn't say is necessarily the "proper" way to apply it, but it works well. After my initial testing period of 2 weeks, I started adding a second toner, which I was somewhat underwhelmed by on its own, with this one and I'm loving the results. It really feels like it's doing something to my skin, but without any tightness or ill effects. I've been using this both morning and night and I really enjoy it. I really think this is a great toner product and would absolutely repurchase. A weightless, but highly active serum that is formulated with Vitamins A, B, D3, E, and K to nourish, protect and heal the skin leaving it refreshed and hydrated. I've been using this exclusively as my daytime moisturizer. 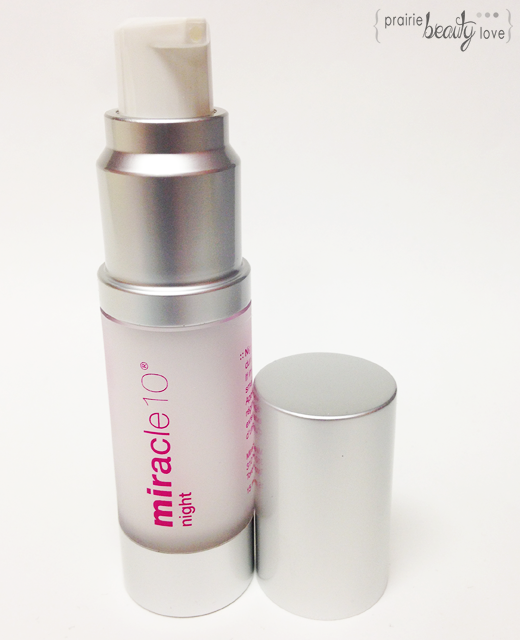 After my initial 2 week testing period when I was using only Miracle 10 products from this set, I added a hyaluronic acid serum to my routine and I find that they work well together. I think this is a really good product that I am really enjoying using. I think my favorite thing about this is that it quickly sinks into the skin and keeps my skin feeling balanced and moisturized through the day. I find that this works really, really well under makeup and doesn't disrupt the finish or the wear time at all - which is an important thing in a daytime moisturizer for me. This has a slight herbal scent to it that I really, really like, but some people might not be so keen on. Again, I would definitely repurchase this product. 8% Glycolic Acid, Salicylic Acid, and Grape Seed Extract combine a scientifically formulated, advanced exfoliator that enhances cell renewal and promote collagen synthesis that help brighten up the skin and create healthy tone and smoother complexion. You guys. I feel like I was blind and now I see after finally really giving acid exfoliation a good try. I'm a convert. If you read my favorites post a couple of days ago, you'll already know that I love this product, but let me tell you more. I feel like this product has done more to improve my skin than literally any other skincare product that I've used in my life. I struggle with a lot of clogged pores, which are not even a little bit cute and are really hard to get rid of without having them extracted, but since I've been using these I've seen a huge decrease in the number of clogged pores on my face. Little white bumps of doom? Hugely diminished. Overall, I feel like I have finally found a genuinely good way to help improve some of my most annoying issues. Need I say more??? A light and soothing silicone barrier night cream designed to hold in active ingredients while helping prevent moisture loss. 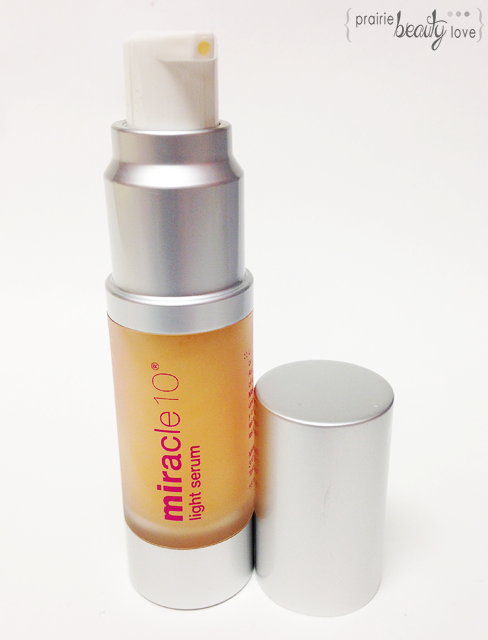 When using this cream, your skin will look refreshed, plump, soft and supple in the morning. This is another product that I really love from this range. I love the idea of a nighttime product that really creates a barrier on the skin to hold in all of the lovely products that you're putting onto it. I find that I've been waking up with my skin both feeling and looking really good, without any dullness or dehydration. I do feel like I fare a little bit better if I add an additional light moisturizer to my skin between the AHA Gel and this product, but even on its own it works quite well. This has a similar scent to the Light Serum and I don't know what it is about that particular brand of herbal-scent, but I really really like it. Overall, I have to say that I'm incredibly happy for what this range has been doing for my skin. I have to say that both the 10 Hour and the 10 Day claims have held really true for me. There wasn't anything that knocked my socks off after 10 hours, but I wasn't expecting that. What I did have was just a really good skin day, which I always love. After 10 Days I really did see an improvement in the overall appearance of my skin. I did have some breakouts, which I actually chalk up to all of the crap being drawn out of my clogged pores, but oddly enough my skin still looked really, really good everywhere else. That's been the biggest thing for me while using this, I've seen those real problems that I've struggled with for so long really starting to improve. I find that I'm using less and less coverage with makeup, because I'm a lot happier with the overall appearance of my skin - and what more could you ask for? 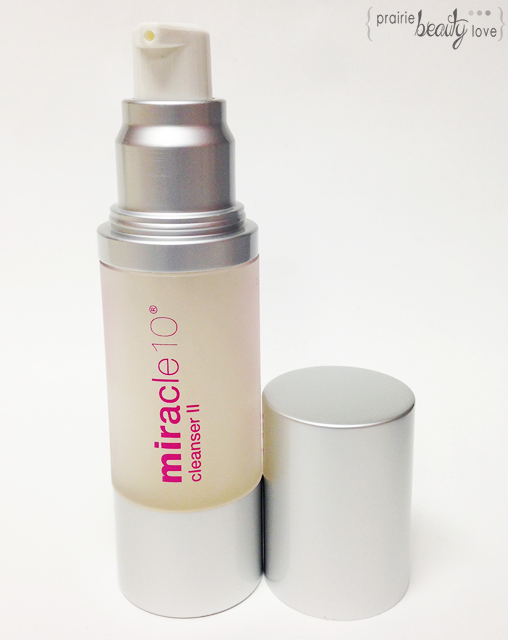 Have you tried any products from Miracle 10 yet? What did you think?